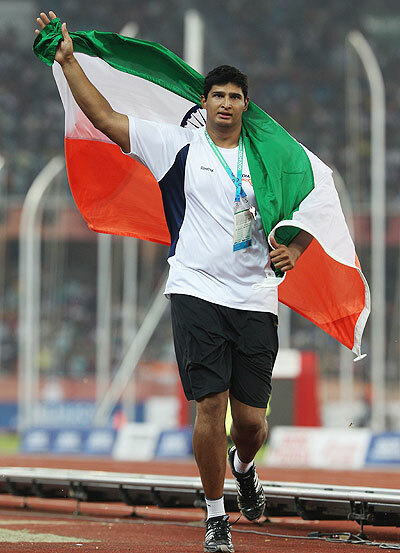 Ace discus thrower Vikas Gowda won the silver medal in the IAAF Diamond League Series in Doha, on Friday. According to a report, Gowda hurled the discuss to a distance of 63.23m, finishing behind Poland's Piotr Malachowski, who took the top spot with a throw of 66.72m. Estonia's Gerd Kanter took the bronze medal, with a best throw of 62.90 metres. The Mysore-born Gowda won the 2010 Asian Games bronze and silver in the Delhi 2010 Commonwealth Games in the discus event. His personal best throw is 66.90 meters which is also the national record in discus throw, achieved in 2013. Young Tintu Luka clocked 2:00:56 secs to finish a poor sixth in the 800m event which was won by Kenya's Eunice Jepkoech Sum with a timing of 1:59:33s. Chanelle Price of the US took the silver with a timing of 1:59:75s while Lenka Masna of Czechoslovakia clocked 2:00:20 to win the bronze medal. The other two finishing ahead of Tintu were Janeth Jepkosge of Kenya (2:00:49) and Molly Beckwith-Ludlow of the US (2:00:55). Manila will host the first leg of the newly launched International Premier Tennis League (IPTL), which has attracted many top players of the ATP and WTA Tour to compete in the team competition. "Bringing world class tennis to new audience's has always been one of the objectives of the IPTL and we are happy to announce Manila as the first host city of our tour across Asia," said Mahesh Bhupathi, Indian tennis veteran and IPTL founder, referring the November 28-30 leg. "We had to divert from the original Franchise Owner in Bangkok as the political unrest forced us to look for an alternative city to ensure the safety of all stakeholders. Manila quickly emerged as the perfect location to stage the event for the coming years as we have world class indoor venues available which can hold more than 20,000 spectators each and secondly, the city that has not seen professional tennis for the past 20 years. The Manila team, represented by Andy Murray, Victoria Azarenka, Jo-Wilfred Tsonga, Carlos Moya, Kirsten Flipkens, Daniel Nestor, and Philippines stand out Treat Huey, will face off against the Singapore "Lions", the Indian "Aces" and the UAE "Falcons". The best players in the world have committed to play in the league, including of world number one Rafael Nadal, Novak Djokovic, Murray, Thomas Berdych, Tsonga, Serena Williams, Azarenka, Ana Ivanovic, Caroline Wozniacki and former Champions Andre Agassi, Pete Sampras, Patrick Rafter, Carlos Moya and Goran Ivanisevic. The league format features a total of 24 matches to be played in the four host cities Manila, Singapore, Mumbai and Dubai from November to December. The teams compete against each other in one-set men's singles, women's singles, men's doubles, mixed doubles and legends singles matches and the team that wins the most games (not sets) wins the match tie. Ice-cool Martin Kaymer produced a controlled display to stay in front of the chasing pack at the Players Championship on Friday, but American Jordan Spieth was in hot pursuit just one shot behind. Germany's Kaymer, who tied the course record with a sizzling nine-under-par 63 on Thursday, followed up with a second-round 69 to post a 12-under total of 132 in the PGA Tour's flagship event widely regarded as the unofficial fifth major. Young gun Spieth, at 20 one of the most exciting prospects in the game, fired a superb bogey-free 66 to occupy second place with compatriot Russell Henley (71) a further three strokes back at eight under. Breezy weather on another hot day at the TPC Sawgrass made the par-72 Stadium Course a more difficult prospect for the players, and Kaymer was delighted to remain at the top after mixing five birdies with two bogeys. Kaymer has not won a tournament since the Nedbank Golf Challenge in South Africa at the end of 2012, but has gained confidence from his improving form over the past month. Tour veteran Jim Furyk was at six under after carding a 68, level with fellow American Gary Woodland, U.S. Open champion Justin Rose, former world number one Lee Westwood and Spaniard Sergio Garcia who all posted 71s. Real Madrid top scorer Cristiano Ronaldo is out of Sunday's La Liga match at Celta Vigo, coach Carlo Ancelotti said on Saturday. The Portugal captain, who has been struggling with minor injuries in recent weeks, limped out of Wednesday's 1-1 draw at Real Valladolid with an apparent thigh strain. With the Champions League final against Atletico Madrid on May 24 looming, it had been decided not to risk aggravating the injury, Ancelotti told a news conference. "Cristiano Ronaldo is not playing tomorrow because he is not at 100 percent and I prefer not to take risks," Ancelotti said. Midfielder Angel Di Maria and defenders Pepe, Raphael Varane and Dani Carvajal were also unavailable due to injury, he added. Real need a win in Vigo to keep alive their faint hopes of pipping leaders Atletico and second-placed Barcelona to the title. With two games left, Atletico have 88 points, Barca 85 and Real 84 in third after consecutive draws that look to have wrecked their chances of a treble of Champions League, La Liga and King's Cup. Atletico host Malaga on Sunday and Barca play at Elche and the top two meet at Barca's Nou Camp stadium on the final day of the season next weekend. Manuel Pellegrini has given Manchester City an "extra push" in his first year in charge, Spanish playmaker David Silva said in hailing the Chilean's impact with City on the brink of their second Premier League title in three seasons. Since taking over from Roberto Mancini at the Etihad Stadium last June Pellegrini has guided City to the summit of the table with 83 points and a two point advantage and vastly superior goal difference over second-placed Liverpool. 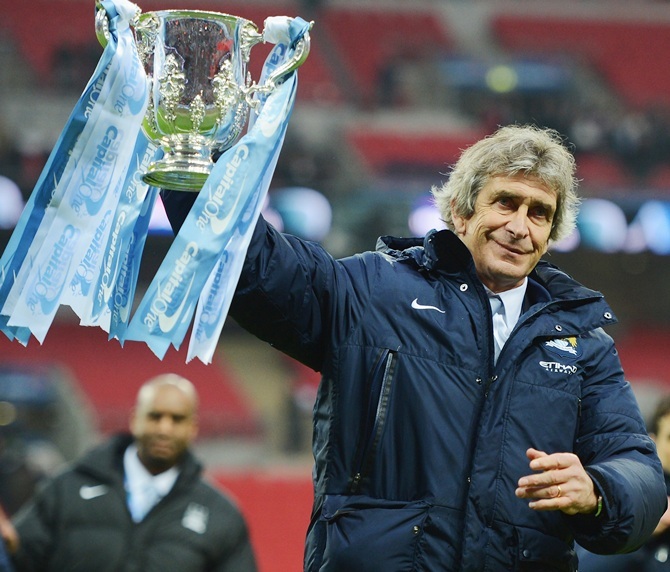 Pellegrini's side host West Ham United on Sunday and only a major shock would prevent City adding the Premier League title to the League Cup they won in March. Free-scoring City have hit 100 league goals this season but Silva believes the manager's influence transcends results and performances. "He's made it a happy place," Silva told www.mcfc.co.uk. "He's brought a joy and happiness; also to our style of play. We are attack-minded and we score lots of goals. "He's made us competitive in every competition. We've gone further in them this season. He's given us that extra push and taken us one step further. "His calmness has been obvious. He's added that to the whole club. And it really helps us at difficult moments. It's nice to have that calm attitude around you when things get tough." After playing a starring role in City's first Premier League title win in 2012 Silva endured a subdued season last year but the 28-year-old has been back to his dazzling best in this campaign and he credits Pellegrini's attacking style as the catalyst. Barcelona coach Gerardo Martino does not believe the club owe him an apology after sporting director Andoni Zubizarreta was filmed this week meeting with Celta Vigo coach and former Barca player Luis Enrique. The meeting, which apparently took place at Luis Enrique's home, prompted speculation Barca were preparing to appoint the former Spain midfielder to replace Martino, who has had a disappointing first season in charge at the Nou Camp. "Nobody needs to ask my forgiveness," Martino, who has contract until the end of next term, told a news conference ahead of Sunday's La Liga game at Elche. 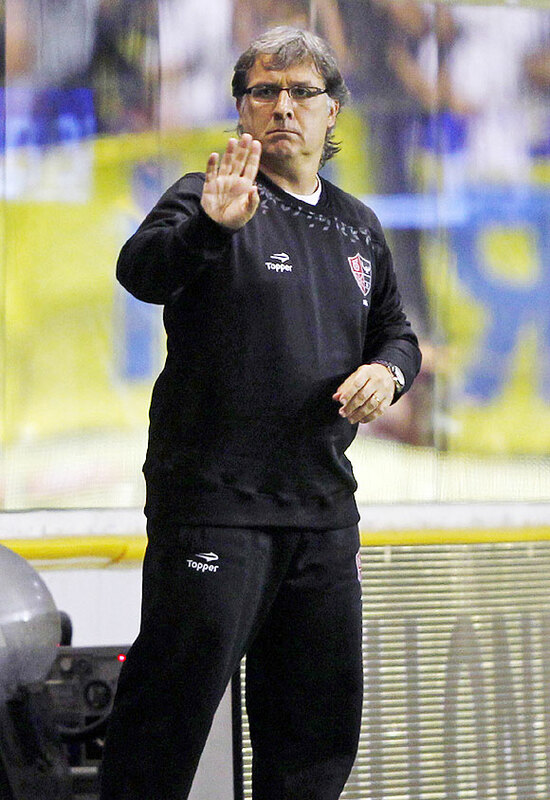 "Nothing the club has done is inappropriate," added the Argentine. "They did not make any error. Either now or in the 10 months I have been here." At the start of last month, Barca were on course to repeat their historic treble from 2009 when they won the Champions League, La Liga and the King's Cup under Pep Guardiola, becoming the only Spanish club to achieve the feat. However, they faltered in key games, losing narrowly to Atletico Madrid in the quarter-finals of Europe's elite club competition and Real Madrid in the Cup final. Their bid for a fifth domestic league title in six years also appeared to be over but Atletico's defeat at Levante last weekend and consecutive draws for Real reignited their campaign. With two games left, Atletico are top on 88 points, Barca have 85 in second and Real 84 in third and the top two meet at Barca's Nou Camp stadium on the final day of the season next weekend. If Barca win their remaining two fixtures they will be champions. Adam Scott made the cut right on the number at the Players Championship on Friday, several hours after revealing that he was married in secret to his long-time girlfriend three weeks ago. The Australian World No 2, for several years regarded as one of the most eligible bachelors in global sport, rebounded from a dismal opening 77 to fire a five-under-par 67 in the second round at the TPC Sawgrass. That left him at level-par 144, and flirting with the projected cutline which was established well after he had left the course. "I don't think I played that much better to be honest," Scott told reporters after totalling seven birdies, including three in his last four holes. Scott sparked a great deal of chatter on the social media networks when he disclosed earlier in the day that he had married his girlfriend, Swede Marie Kojzar, on April 17 during an intimate ceremony in the Bahamas. "It's official. 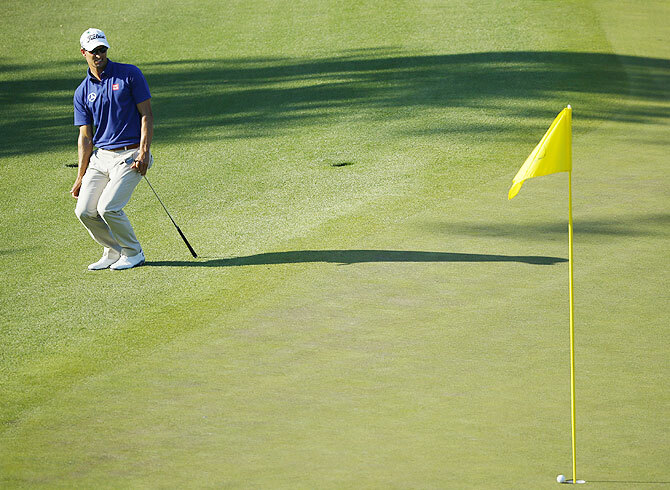 I am a settled down man and very happy," Scott told Australian Associated Press after finishing his second round. "We just decided to get on with it, we've known each other long enough, let's go and jump right in the deep end. "It was just our family and a few friends and obviously there are a lot of people we would have liked to have had there who weren't but we decided to have a very low key affair." Kojzar, a Swedish architect who dated Scott long term in the early-to-mid 2000s before a split of a few years, reunited with the Australian shortly before he won his first major title at the 2013 Masters. Photos: 10 crazy pitch invasions!